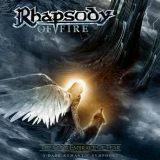 Rhapsody Of Fire may not be the most meaty and aggressive band around, but they’ve always had a knack for putting a smile on my face, and latest EP The Cold Embrace Of Fear is no exception. Of course, whether they mean for their brand of massively over-the-top symphonic sumptuousness to cause amusement is quite another matter, but I’m prepared to admit to enjoying them, whether the band have a secret tongue in their cheek or not. There are few enough metal bands around whose music cheers me up to start worrying about whether Luca Turilli and co have emotional investment in their epic fantasies or not. After all, you have to give them their due. What other band proved to the world that Christopher Lee was genuinely metal? What other band would use over six narrators on an EP, as they do here? Rhapsody Of Fire occupy their own especially frilly niche in a very frilly section of the Power Metal market, and all the more power to their elbow for it. The Cold Embrace Of Fear is supposedly one long piece, although enough of it is taken up with ridiculously hammy narration to enable you to skip a couple of the songs. Opener Act I – The Pass Of Nair-Kaan, for example, deals with a couple of travellers fighting their way through a gale, fleeing from a strange howling noise, who fall down a mountain due to an avalanche. Despite the reasonably professional orchestration, the voice acting is utterly awful if amusing, and despite the addition of Christopher Lee’s ominous tones in Act II – Dark Mystic Vision, there’s not much point in listening to that every time, either. Where the EP really kicks off is in the fourteen-minute Act III – The Ancient Fires Of Har-Kuun, launching into percussion-backed orchestration with female operatic wailing and the first actual guitars follow shortly. It’s a complicated mix of acoustic instrumentation, ballad-esque crooning, and orchestrally-backed power metal stomp, tied together very well and approaching the realms of prog at times – certainly does Therion’s job better than their last album did, which is high praise considering who I’m giving it to! An excellent piece of power metal glory, all around, certainly the highlight of the EP. For the rest of it, there’s more Christopher Lee on Act IV – The Betrayal and Act VII – The Angels’ Dark Revelation, and enough over-the-top drama (all I took away from the story is that there was an avalanche, and some wizards stole a book off someone) to rival Lord Of The Rings itself. Hold your finger awhile on the skip button, however, as Act V – Neve Rosso Sangue is a nice-sounding Italian-sung ballad, and Act VI – Erian’s Lost Ballad is more typically Rhapsody-ian power metal, ending in a repetition of an especially grand section of Act III... All in all, it would be untruthful of me to say anything other than that I had an absolute blast, and will be checking out the band’s album from previously in the year to see what I missed! Highly recommended for fans and those with imaginative minds.